The Hyundai corporation has officially dipped its toes into the world of high-end luxury, and they’ve done so in the purest sense of the word. 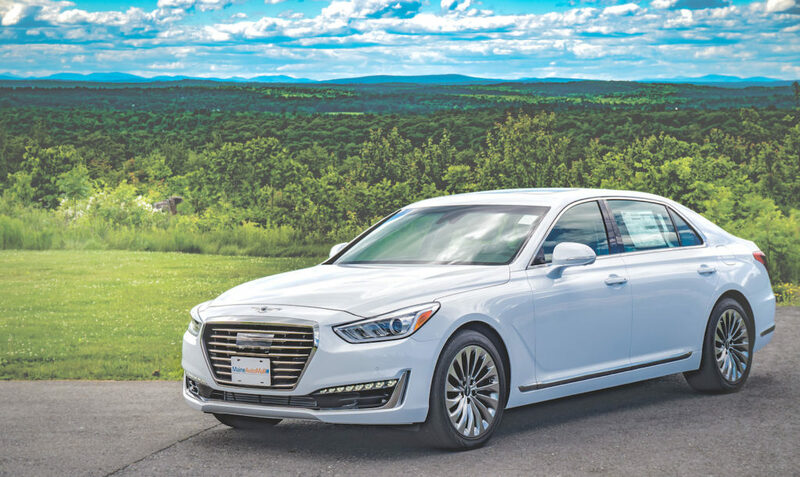 Late last year in 2016, standalone Genesis brand was launched as a successor to Equus, and the G90 serves as the flagship model for that current duo lineup. The G80 fills the role of the smaller sibling, and you can read our review of that model here. 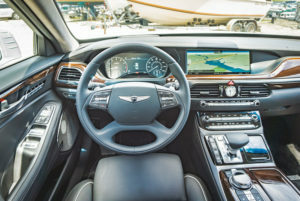 This review is of the 365-hp 3.3-liter twin-turbo V-6 model of the G90 with HTRAC All-Wheel-Drive. You can also configure it with a 420-hp 5.0-liter V-8 if that suits your fancy, and either model comes with RWD or AWD depending on your preference. Personally, I would likely prefer the twin-turbo over the V8 anyways, since I tend to lean more towards lighter more efficient contents under the hood. And I honestly can’t imagine needing more power than what I experienced. I had a chance to drive the G80 soon before I drove the G90 and was a little underwhelmed with the performance side of things, it just didn’t feel responsive enough if I’m being honest. Pretty soon after slipping in behind the wheel of this older, wiser, and easily more dominating sibling, it became apparent that this was a different animal altogether. The acceleration in the G90 is superb. It glides up to 70mph with a sense of confidence, a touch of savagery, and a refinement that you’d expect from a $70k machine. The G90 supports 5 different drive modes that you can change to suit your style, Smart (which is the default), Sport, Eco, Individual, and Normal. The Smart mode adjusts according to how you are driving at any given time, so if you mash the pedal it will take the hint that you demand performance and will swiftly oblige. It’s pretty good, but if you want to stay consistent with a particular style, I recommend just setting it to one of the other ones. For the back half of my time with the car, I set it to Sport mode and found this to really make quite a difference in how much fun I was having with it. It was as if the G90 had taken a shot of espresso and was instantly ready to tear up the pavement. The engine and transmission response came alive, the suspension became surprisingly tight and agile for a car of such size, and the steering wheel transformed into a mechanical extension of my body and brain. 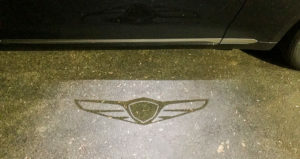 I wanted to keep it there forever, if it wasn’t for the sacrifice of fuel efficiency. The Individual mode, though, allows you to make adjustments to each of those three separate points on the car. This is in a broad sport/comfort sense, however suspension gives you 3 options – Comfort+, Comfort, and Sport, respectively. So you can really personalize this gadget vehicle to your liking quite nicely. Speaking of customization, we should address one of the finer points of this vehicle right away. That of the dashboard and navigation of said dashboard. It’s really good! 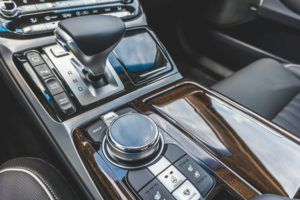 So many car manufacturers today are trying to pack in as much gadgetry and menu options as possible to the point that it gets very confusing which translates to frustration very quickly. This is not the case with the G90, in my honest opinion. There’s a nice large dial which provides satisfying yet smooth clicks when turning it, and a larger, heavier click when pressing it down. The dial also allows you to push the whole mechanism in up-down-left-right motions which in many instances of the menu system jumped the cursor to the bottom or top of the list for faster navigation. A nice touch indeed. I enjoyed using it and found that it was very easy and comfortable to make adjustments within the clean, simplistic menu system even while driving. This is so important as this goes beyond comfort and convenience and bleeds into the safety category. Hear That? Yeah, Me Either. Out of the 5 human senses, which one is most impactful on your driving experience? The argument undoubtedly goes to the sense of touch, what it feels like to drive the car. And we’ve discussed that at length. But after a few hours of driving the G90, there’s one thing that really made me stop everything and rethink that completely. Could it be that sound is more important? The exhaust notes of a performance car, that’s superbly important but not chief concern for most. The sounds system is also a big deal for many, and the 17 speaker 7.1 surround Lexicon system in the G90 is no slouch, especially with it’s ultra crisp Quantum Logic Surround technology simulating the sound achieved within a large concert hall. How about how quiet a car is? Well, if you have a chance to ride in a G90, you might start to think that the decibel level is something that makes the rest of the potential selling points of any car seem trivial. The silence that is achieved within the Genesis G90 is staggering. Absolutely staggering. Whether you’re cruising at or above highway speeds, or sitting in traffic, it is eerily dead quiet within the cabin. This is thanks to the extraordinary effort that was put into cutting decibels to a minimum. All the doors have three-layer weather-striping paired with double layered sound-proof glass. 20 percent thicker carpet and headliner insulation, foam pads in the rear quarter panels, and a powertrain seal to block engine noise in the cabin make a huge difference. Even the wheels and aerodynamics are designed for ultimate quiet. The two-piece wheel design produces a sound-absorbing, hollow structure that reduces tire noise. It’s as if I was wrapped in a cocoon of blissful silence, a great thing for someone like me who handles the bulk of their heavy thinking while driving. Conversation with my wife, either while sitting next to me or over bluetooth was effortless and truly pleasant. Until visiting the Genesis G90 website, I wasn’t sure how to correctly describe the driver’s seat. They call it a First Class VIP Seat. 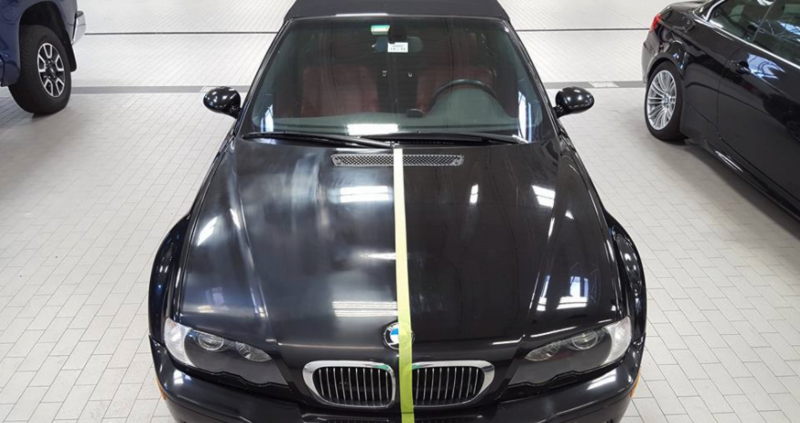 You might think, “Of course they do, they’re trying to sell the car to you”. And you’d be right. But you’d also be wrong if you assumed that was their sole purpose in their crowning it with that title in a self-congratulatory fashion. They have unquestionably earned that description with the level of attention they’ve put towards this seat. And you don’t have to take my word for it. The back and spine specialists at Aktion Gesunder Rücke (AGR), a campaign for healthier backs, have given these ergonomic seats their seal of approval. It’s a seat made to improve your health and comfort. 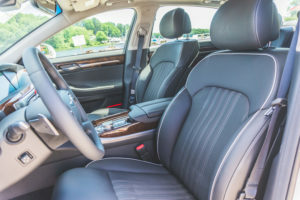 22-way adjustability is more than I’ve ever seen in a car and it adjusts from cradling the back of your knees all the way up to fine pinpoint adjustments to the headrest. Genesis guarantees your comfort in that driver seat. I was thrilled to get in and drive at any chance I had. It was as exciting to drive it as it was to just sit in it. It felt like home after a while. Even the alcantara headliner added to the feeling of being wrapped in luxury. In a Hyundai. 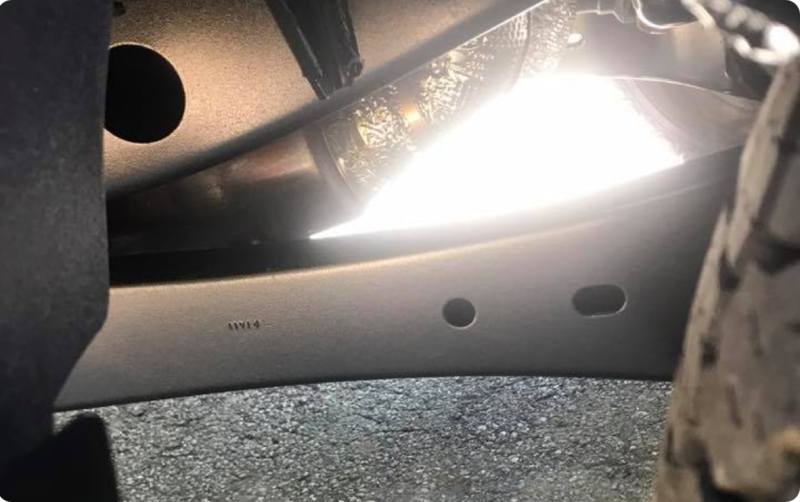 Yes, it will be quite a while before the Genesis brand detaches completely from Hyundai and I hope that consumers take this offering from them seriously resulting in sales numbers that translate to more from Genesis in the future. 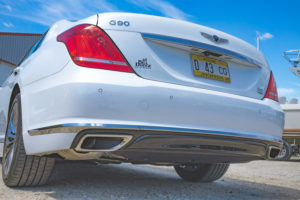 Right now it’s just the G80 and G90, but by 2020, a luxury sedan, a sports coupe, and two SUVs are also expected to be introduced bringing the number of Genesis models to six. I’d love to see that happen. Our friends at Bill Dodge Brunswick, Maine’s only Genesis dealer were nice enough to let us enjoy this vehicle for a week while doing the review.